The holidays are such a wonderful time of year, full of celebrations, family, friends and food - but it can also be a stressful time of year for those very same reasons. Before you know it, you've missed the timeframe to pick up and put together special gifts for every person on your list. That's why we're here to help with 5 quick ideas to create personalized gifts that won't hurt your budget or take up all of your time. Check out the how-tos, below! 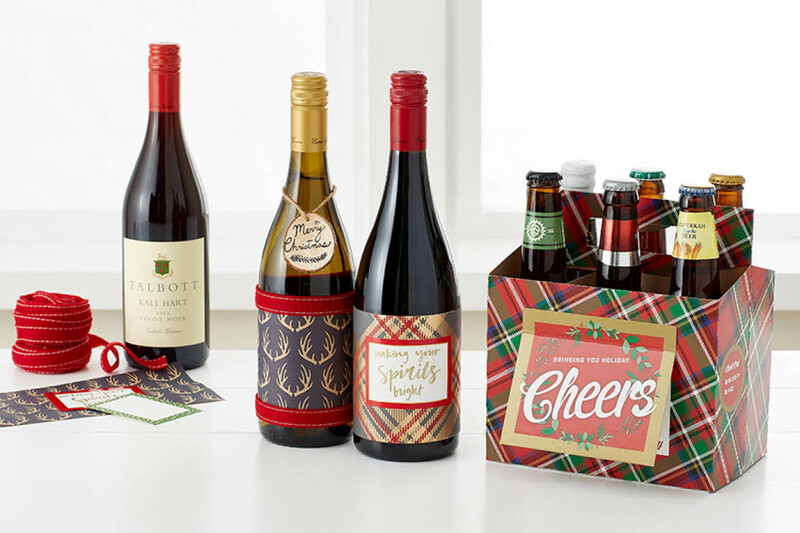 The gift of wine and beer is always a great idea, but making it a little more personalized makes this gift feel fully seasonal and a little more special. For the wine, simply cut our Grey & Gold Plaid Recycled Wrapping Paper Sheets and/or Antlers Wrapping Paper to cover the middle of the wine bottle. Take a label to personalize it further, or add some Red Felt Ribbon to accent the colors and you're done! 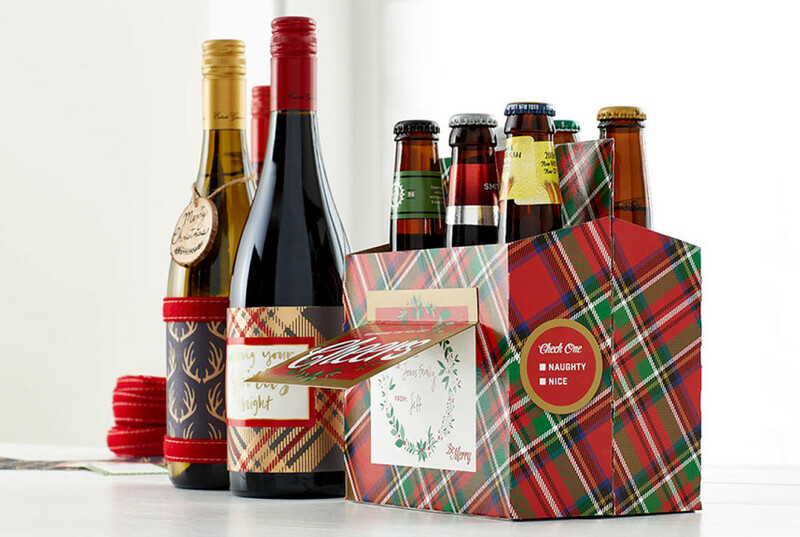 For the beer, you can either buy a six back of their favorite beers or pick out several brews you think they'll like and tote them in our Holiday Plaid Six-Pack Carrier with Card to really make it stand out. Both of these ideas can be purchased in multiples and easily catered to each person you'd like to gift to. Personalize something they'll keep forever in just a few steps with this idea. 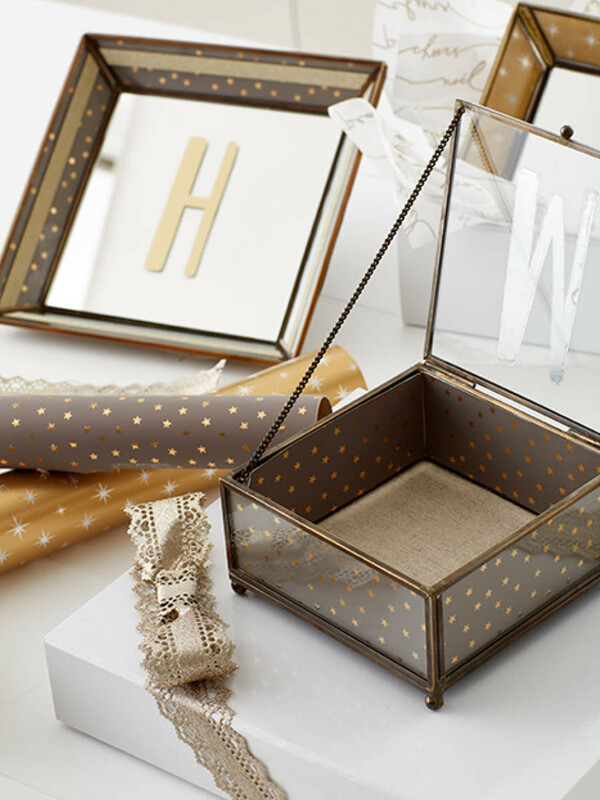 We started with our Antique Brass Jewelry Boxes and Three by Three Mirrored Glass Jewelry Trays, and customized them by lining our Taupe & Gold Tiny Foil Stars Wrapping Paper and Gold Prismatic Stars Gift Wrap inside and around the edges. To finish, we cut our Gold Glitter Decorative Tape into the initials of each recipient for an added personalized touch. Gift baskets are a great idea for gifting in multiples because of their open and flexible design that can really store any grouping of items. We used our Marche Basket filled with yellow and red shred as our starting point to frame the rest of the gift. 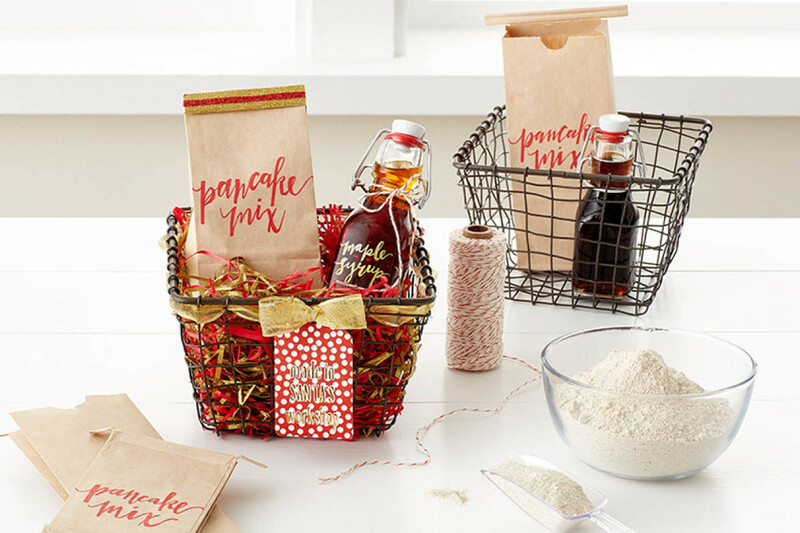 We then used a basic pancake recipe to create the "pancake mix" that we filled each Kraft Coffee Bag with, and filled each of our Italian Glass Bottles with specialty syrup. We labeled each with permanent paint markers for a festive gold and red touch that tied the gift together. To finish, we framed the basket with Glitter Wire Ribbon and a festive Gift Tag. 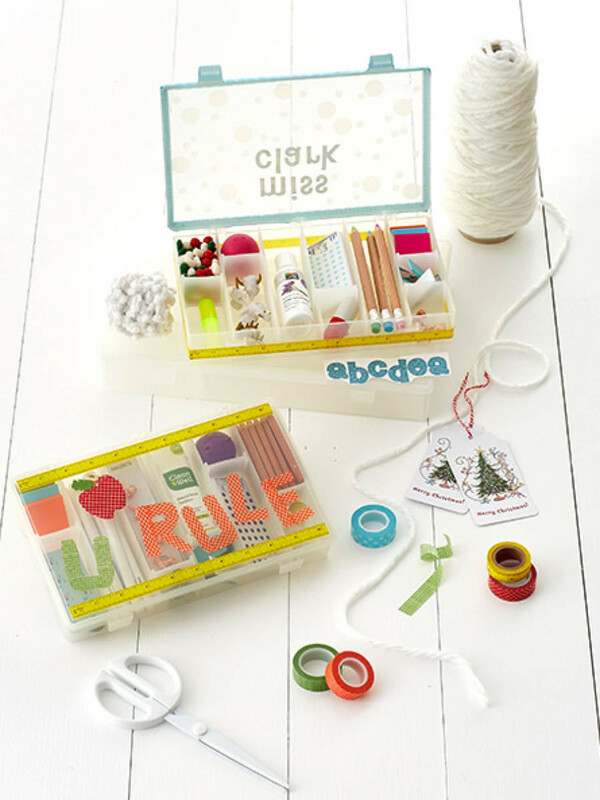 For those ultra-creative teachers on your list, think of putting together this interactive classroom kit they'll love to create from over and over again! To put this together, we started with our Infinite Divider Boxes and decorated each exterior with our teachers styles in mind, then we filled it with the supplies and accessories they'd need multiples of for any classroom need (think notepads, pencils, hand sanitizer, push pins, highlighters and more). Once we finished filling we secured the boxes with a bow of Yarn Ribbon. In minutes, a perfectly personalized holiday gift for every great teacher on your list. Perhaps the easiest of make-ahead gifts on this list are our take-home treats! All you need to create this gift are your favorite sweets, Snowflake Takeout Boxes and Gift Labels. 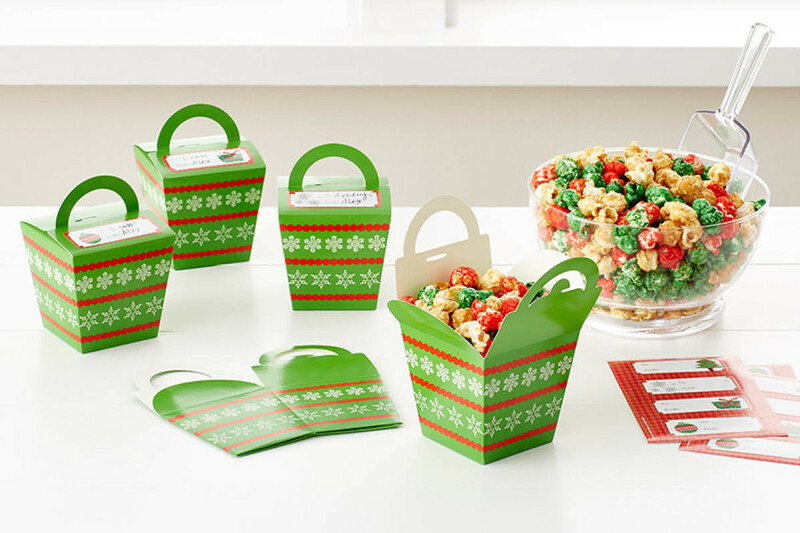 We picked our favorite festive caramel popcorn, filled each treat box and added a label with the recipient's name. It's the perfect bulk gift to hand out at holiday party or family gathering. There you have it, five easy ways to gift this year! If you have any ideas of your own, or want to see more options for specific types of gifts, let us know in the comments and happy holidays!